On 25 February 1870, Hiram Revels (1827-1901) presented his credentials from the state of Mississippi, which had been readmitted to the Union just two days earlier, and took his seat in the U.S. Senate as the first African American to serve in Congress. Born of freed black parents in the North Carolina piedmont, the 42-year-old Revels had migrated through Indiana, Illinois, Ohio, Kansas, Kentucky, Maryland, Tennessee, Missouri, and Louisiana as an educator and Methodist minister before settling in Natchez, Mississippi in the immediate aftermath of the Civil War. Reconstruction-era policies gave newly-freed African Americans unprecedented access to both the voting booth and state legislatures. Revels was elected to the state senate in 1869. One of the most pressing tasks that fell to the southern states’ legislatures after the war was to resume their election of senators to Congress. (U.S. senators would not be elected directly by the people until ratification of the 17th amendment in 1913.) Mississippi’s new U.S. senators, once seated, would face reelection in 1871 and 1875, respectively; the latter seat had belonged to Jefferson Davis, former president of the Confederacy. State Republicans saw the election of an African American to one of these seats as a symbolic victory; state Democrats (who had largely supported secession in 1861) saw electing an African American as a chance for Republicans to shoot themselves in the foot, by showing the ridiculous extremes to which their “Radical Reconstruction” policies would lead. With votes from both parties in the state legislature, Hiram Revels was elected to the term due to expire the very next year. Revels was not the first African American elected to Congress. John W. Menard, Representative-elect for Louisiana, holds that distinction. But Democrats in Congress succeeded in challenging those election returns. The same strategy might have been resorted to for preventing Revels’s being seated—except that it is harder to dispute the election count of a small legislature than of an entire congressional district in the midst of radical transformation and electoral irregularities. So Senate Democrats chose a different tack: they insisted that Revels had not met the nine-years’ citizenship threshold required by the Constitution. By passing the Civil Rights Act of 1866 and the Fourteenth Amendment (ratified in 1868), Congress itself—they maintained—had recognized that African Americans were not truly citizens up to that time, just as the Supreme Court had ruled in the Dred Scott case of 1857. Senate Republicans insisted, on the contrary, that the Act and the Amendment conferred instant citizenship. After a lengthy debate marked by lofty claims of equality and cheap pandering to racist principles, and by a vote of 48 to 8, Revels was seated at 4:40 p.m. on 25 February 1871. For more information on Revels, see his entry in Blacks Americans in Congress. It feels like we’re getting nothing but wall-to-wall coverage of the last big anniversary events here in DC. As the speeches wrap up, here are links to few things you may not have seen already. To start, here’s a list of many of the commemorations that took place in the last week. I include it because of the list of exhibits at the bottom, most of which will be around through at least September. This piece includes images of maps and programs from the 1963 March. A long article from the Department of Transportation includes the note that the Kennedy Administration opposed the idea of including the Capitol grounds in March and states that 75-100 members of Congress attended the event. It’s a good read, including numerous quotes from period coverage and discussing, among other things, how people traveled to Washington and the traffic and weather conditions they encountered during the event. One of the Library of Congress blogs did a short series on the March, including an interview with Rep. John Lewis, who spoke at the Marches both in 1963 and today. Other posts in the series contain audio and video recollections from the event. 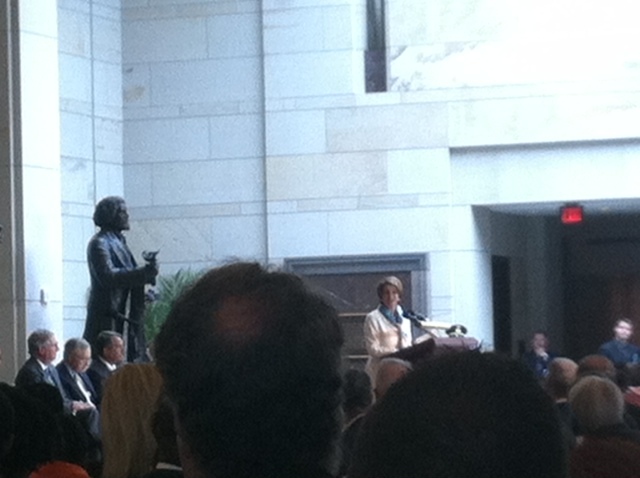 C-SPAN has coverage of the July 31 ceremony in the Capitol’s National Statuary Hall. On August 28, 1963, over 250,000 demonstrators assembled along the reflecting pool in front of the Lincoln Memorial to call for the end of racial segregation and increased civil liberties for African Americans. Few in attendance could have imagined what a pivotal historical moment the day would become over time. For those there, the goal was to send a message across the United States that the time for racial equality had arrived. With buses parked all over the city, trains and planes unloading throughout the morning, and private automobiles arriving steadily from outside the city, the national capital was set to witness an unprecedented gathering. With thousands in the streets and beginning to move toward the National Mall, the scene was dramatic and inspiring. The marchers held their placards high calling for Freedom, Jobs, and Justice as they headed past the U.S. Capitol and Washington Monument for the Lincoln Memorial. In retrospect today, the March can be seen as an epic occurrence in the larger context of the American civil rights movement. The roots of the event are deep in the early 20th century segregated society that the United States had evolved into after the 1896 Supreme Court decision legalizing the separate but equal doctrine. In 1910, reformers came together to found the National Association for the Advancement of Colored People, which launched a process of legal challenges aimed at overthrowing racial segregation. 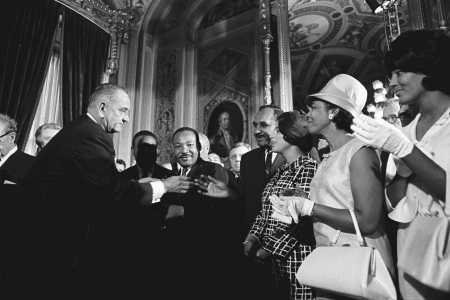 In the following decades, the NAACP joined other civil rights groups to press for equal rights for African Americans and the desegregating of the nation’s political and social institutions. Over all these years, many outstanding figures emerged to advance this agenda, but particularly significant were William E. B. DuBois and A. Philip Randolph. Both individuals come to mind with regard to the 1963 March for different reasons. 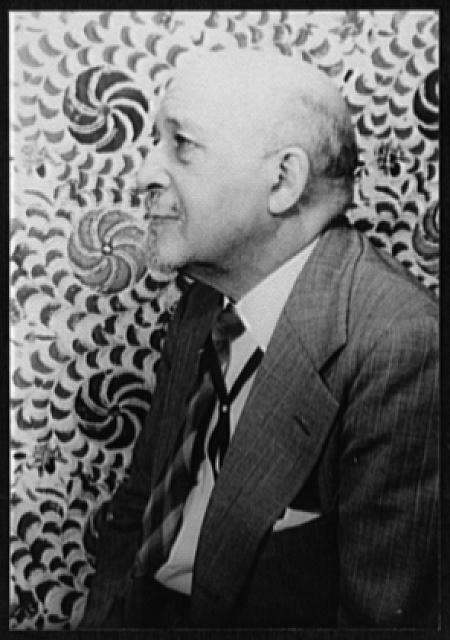 At 95, and living in Ghana, DuBois helped bring about the moment by the remarkable career he had as a writer and editor in behalf of the cause for African American equality. His books, especially Souls of Black Folk (1903), had inspired and motivated racial reform throughout the years leading up to the March. He had moved to Africa late in life to edit the Encyclopedia Africana. While there, his health failed and he died on August 27. His death was announced to a shocked crowd at the March. While younger than DuBois, Randolph and his years of activism paralleled those of the more famous black scholar. Randolph’s contribution was as a union leader and advocate for federal governmental racial reform. In 1941, he had called for a march on Washington to protest discrimination in federal hiring contracts. That attempt did not take place, but the idea remained alive in his mind. He continued to call for a national demonstration to advance black civil rights. Thus, as the first efforts to do just that emerged in 1962, Randolph became a natural leader of the plan. In the end, the hope for such a march he had envisioned in 1941 finally came to fruition. He was one of the major speakers at the 1963 event. Other historical threads wove their way into the 1963 march. The American labor movement, particularly the Congress of Industrial Organizations led by Walter Reuther, had long worked in the civil rights struggle. On that August day in 1963, he joined the leadership of the march. Not at the march, but watching from his home was former President Harry Truman who, in 1948, had issued an executive order desegregating the American military, a decision which had increased the momentum and pace of the call for reform. Then, in 1954, the Supreme Court under Chief Justice Earl Warren reversed the separate but equal doctrine by ruling segregated public education to be unconstitutional. Over the next nine years, that decision produced the immediate events which created the need for a March on Washington. All these developments, and many others, helped set the stage for August 28, 1963. Despite many concerns that the event might lead to violence, the March on Washington occurred as a model of peaceful protest. The thousands who took part experienced one of the most compelling and thrilling events of American history. They saw, gathered together on one platform, most of the nation’s civil rights leadership and prominent African American performers, all there for one reason: to affirm a dream of an open and integrated society. On the stage in front of the Lincoln Memorial stood singers Marian Anderson, Camilla Williams, and Mahalia Jackson, activists Bayard Rustin, Daisy Bases, Rosa Parks, John Lewis, Whitney Young, Benjamin Mays, and Roy Wilkins, among many others. The speeches they gave and the songs they sang brightened the hope of all in attendance. Of course, the main speaker at the event was Martin Luther King, Jr., and it was almost immediately clear that his “I Have A Dream” speech would emerge as one of the great American orations, pulling together all the ideals and promises that had sustained African Americans in their long struggle for equality. In the end, however, the significance of the 1963 March on Washington was much larger than a single speech. The day had changed America. While the goal of greater civil rights was far from becoming a reality, and many struggles and setbacks were yet to unfold, this seminal event would always provide a source of inspiration for future generations. It was, and remains, a day to remember. Editor’s note: We asked author James Johnston to comment on the research he did for his book, From Slave Ship to Harvard, which traces the tribulations and successes of an African American family in Maryland over a 275-year period, from 1736 to 2011. Johnston already wrote about the family on this blog; here’s a look at the rich and varied sources he used to investigate his subjects. I was pleasantly surprised during my research to discover that, contrary to common belief, people did keep black history before the Civil War. This was sometimes done by the unlikeliest of writers. Jacob Engelbrecht of Frederick, Maryland, is an example. He was a tailor and minor politician, the son of a Hessian soldier imprisoned at the Hessian Barracks in Frederick during the American Revolution. Yet his private diary–extending over twenty-two volumes and 59 years in the 19th century–recorded marriages, births, deaths, news, milestones, and ruminations about the segregated white and black communities around him. Short snippets captured the activities of one family that I was interested in, the Hillmans. According to the diary, George Hillman was the “president” of the black community, whatever that meant. Frederick Hillman worked for lawyer William Ross. Ignatius had a plot of land near the paper mill. Aaron died of cholera on September 21, 1832. Each little bit added up. From independent sources, I knew that when Ignatius’s wife Nancy Hillman came into money, she turned to Ross’s son to write her will. 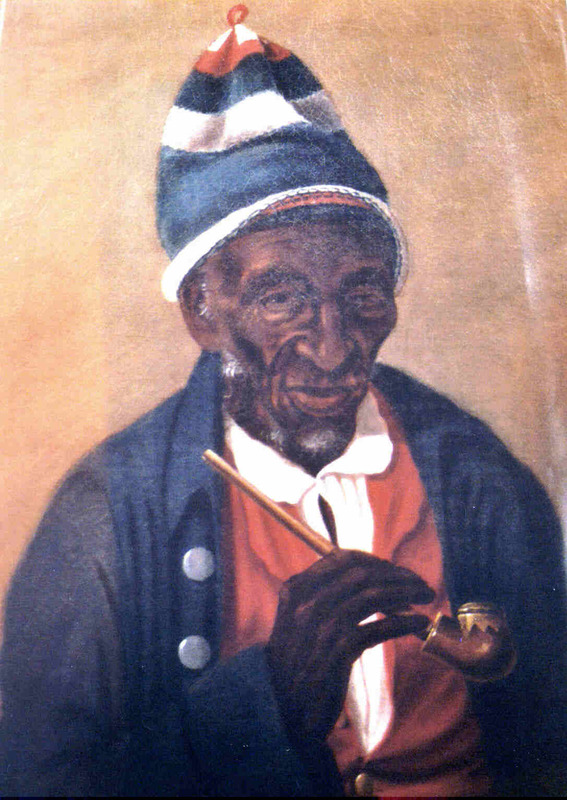 Stories about the man who came to America on a slave ship, Yarrow Mamout of Georgetown, were recorded in the diary of the artist who painted his portrait, Charles Willson Peale, and in an 1816 book David Bailles Warden wrote about the new capital of the United States, A Chorographical and Statistical Description of the District of Columbia. Warden even quoted Yarrow speaking in a rich, poetic, dialect. I found frightening accounts of the deprivation and violence of slavery described by slaves in a variety writings, such as the autobiography of Josiah Henson of Montgomery County, Maryland, a book that Harriet Beecher Stowe relied on in writing Uncle Tom’s Cabin. I gleaned additional facts from censuses and from oral histories handed down over 130 years. Newspapers occasionally carried articles about African Americans. The passings of two members of this talented family, Yarrow (his last name) and his daughter-in-law Polly Turner Yarrow, were celebrated with obituaries in white newspapers. At the National Archives, I found records of the lawsuit Nancy Hillman brought in 1841 to recover on a loan of her uncle Yarrow. She won what was perhaps the first damage recovery by an African American in Washington D.C. The Archives also had the Civil War pension records of family member Simon Turner. Living descendants had material too. 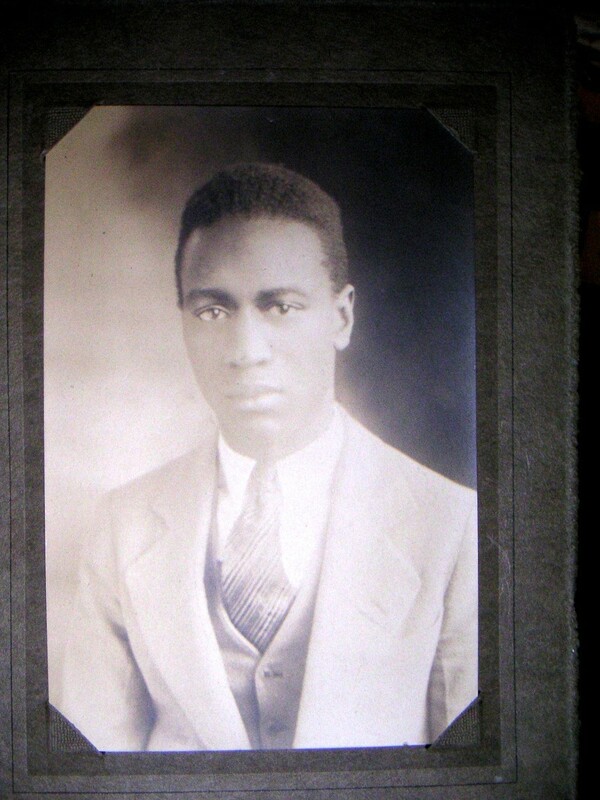 Alice Ford Truiett of Baltimore had the Harvard graduation photograph of her father Robert Turner Ford from 1927. He was Simon Turner’s grandson and Polly Yarrow’s great grandnephew. Robert Ford’s niece Cynthia Ford Richardson had a copy of a 1984 interview of him she did for an oral history project. The most surprising family document was an 1847 promissory note, signed with an “X,” and passed on by a generation that obviously could not read its contents. Black history, more than most history, is like a Seurat painting. Seen up close, it appears to be nothing more than a series of unconnected dots, but once you put the dots together and step back, a picture emerges. Fifty years ago, as they had for nearly a century, Americans celebrated Memorial Day. Then as now, it was a time of remembering those who had died defending the nation. Originating as Decoration Day and first held in 1868 at Arlington National Cemetery, the remembrance of the Civil War dead had long served as a powerful statement of national memory. Over the years, however, Memorial Day had become a national holiday that, for many, had lost much of the feeling associated with its founding. After nearly a century, many Americans responded to event by traveling to visit family and celebrating the coming of warmer weather. In that context, Vice President Lyndon Johnson chose to restate the familiar phrases of remembrance in terms, and language, that would link Memorial Day to an issue that was very much on the mind of contemporary Americans. 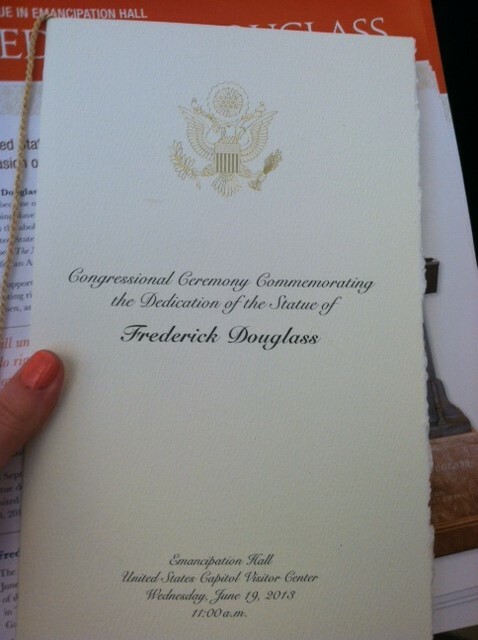 To do this, he traveled to the Gettysburg Battlefield to deliver an address on the occasion. The location and timing was designed to honor both the men who died there a century earlier and the unforgettable comments that Abraham Lincoln had spoken there in the aftermath of that great battle. He chose this place and moment, however, for another reason. Increasingly concerned by the growing racial and civil strife of the time, he sought to broaden the significance of honoring Memorial Day to focus on the unfolding struggle by African Americans for full civil rights. In the decade after the 1954-55 Supreme Court decisions ending segregation in public education, the movement to achieve those rights had deepened but had yet to develop new federal legislation that could undo the effects of racial segregation still in place throughout the nation. In these few words, Vice President Johnson had both expanded the meaning of Memorial Day and connected the event to the unfulfilled promise of the Emancipation Proclamation. Still, these comments remained only words of lament, not a plan for action. However, after the tragic death of John Kennedy and with becoming President, Lyndon Johnson resolved to transform these sentiments expressed in May of 1963 into new federal legislation. In what many historians see as a direct extension of the Emancipation Proclamation, he would sign the 1965 Civil Rights Law, one of five new civil rights laws passed by Congress between 1964 and 1968. Thus, after a century of unfulfilled promises, the words of equality had become laws that would, in the coming years, begin to restore the future for millions of Americans previously denied their most basic rights as citizens. 1. A copy of Lyndon Johnson’s 1963 Memorial Day Address is maintained at the LBJ Presidential Library, University of Texas, Austin, Texas. It is available online. 2. The historical work on the life of Lyndon Johnson and his impact on American life and culture is extensive and impressive. Two works are particularly relevant to this blog: John L. Bullion, Lydon B. Johnson and the Transformation of American Politics (Pearson, 2007) and Robert Mann When Freedom Would Triumph: The Civil Rights Struggle in Congress, 1954-1968 (Louisiana State University, 2007). Editor’s Note: We’re back to regular posting after an unexpected hiatus. Thanks to our newest poster, author James Johnston, for getting us started. His piece includes some information from his recent book, From Slave Ship to Harvard: Yarrow Mamout and the History of an African American Family. A Christmas Eve tradition in Georgetown in the early 1800s was for African Americans to stroll through the streets and sing carols at the homes of wealthy white residents. The next morning, the leader of this band made the rounds again, firing off a shotgun to solicit donations for the effort. Though it must have been a touching sight, it was unusual in two respects. First, it was illegal in those days for African Americans to congregate after dark (one third of the population of Georgetown in 1800 was black of whom 16% were free), but everyone seemed to understand Christmas Eve was an exception. Second, the leader of the band, a man named Yarrow Mamout, was a devout Muslim. As this example suggests, race relations in the new capital of Washington D. C. were more complex than commonly believed. Yarrow (his last name) was another example of the complexity. He was a Fulani from Guinea and had been brought to America in 1752 at age sixteen on one of those terrible slave ships. He had been educated in Africa and could speak at least three languages. He was literate in Arabic and could write his name in English. He valued education so much that he arranged for his son to be taught to read and write at a time when teaching blacks to read was generally discouraged. 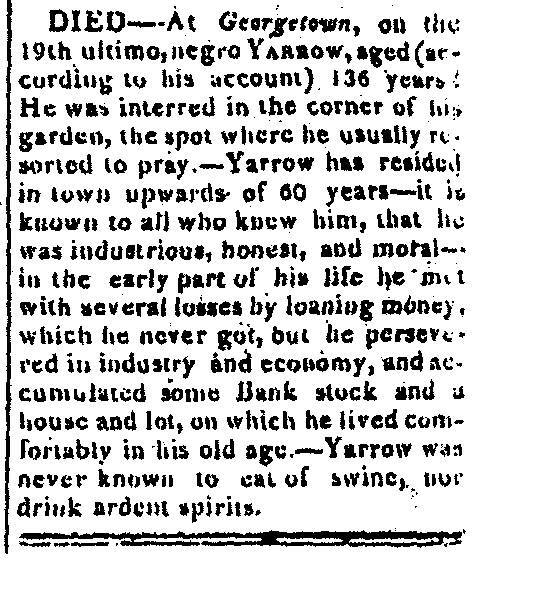 Yarrow was enslaved for forty-four years as a body servant before being freed. Three years later, he bought a house in Georgetown. As a freeman, he became a jack of all trades, loading boats at the wharf during the day and at night making baskets for sale. He also could turn wood into charcoal and had no equal as a brick maker, commanding wages that were one and a half times more than white laborers. Athletic, he was said to be the best swimmer ever seen in the Potomac River at Georgetown. He saved his earnings and became a financier, loaning money to merchants and even buying stock in the Columbia Bank of Georgetown. Of course the tavern where the bank held stockholder meetings also served as a site for slave sales. Adding to the complexity of race relations, in Georgetown, Yarrow rubbed shoulders with the family of the slavers who had brought him from Africa, but then everyone did. Christopher Lowndes and Benjamin Tasker, Jr. had arranged that slaving voyage back in 1752. They were brothers-in-law. Lowndes had married Tasker’s sister. Tasker’s father was governor of colonial Maryland. Others in the Lowndes family were also in the transatlantic slave trade. In fact, they were responsible for transporting an estimated 9,600 slaves to the Americas over a period of forty years. Lowndes’s daughter married Benjamin Stoddert, who was an aide to George Washington during the Revolution and later the first Secretary of the Navy. Lowndes’s son, Francis, followed in his father’s footsteps in the slave trade and even captained three slave ships. He used the profits to buy a house in Georgetown that he later sold to Robert Peter and his wife Martha Custis, granddaughter of Martha Custis Washington. In 1818, the famous American portrait painter Charles Willson Peale came to the capital for the purpose of painting a portrait of President James Monroe and other political and military leaders. Congressman Henry Clay of Kentucky sat for Peale but Congressman William Lowndes of South Carolina, a distant relative of Christopher, turned Peale down. 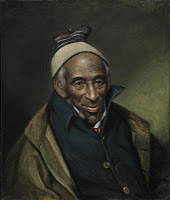 Hearing that Yarrow might be 143 years old and that he owned a house and lot and bank stock, Peale contacted him and in January 1819 painted a stunning portrait of him, portraying the African as a wealthy Georgetown burgher. Whether intended so or not, it stands as a dramatic and enduring statement of racial equality. Yarrow’s belief in education also endured. In 1923, a relative of his daughter-in-law, a man named Robert Turner Ford, entered Harvard University and graduated four years later. 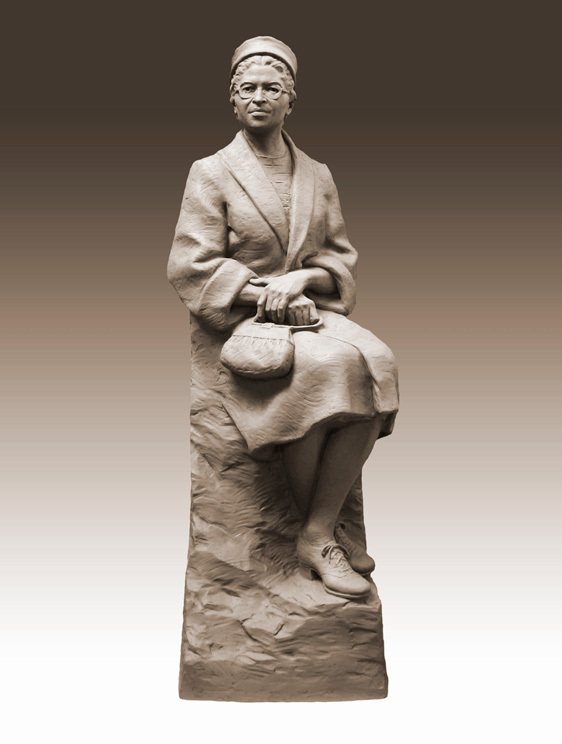 The impressive statue of Rosa Parks unveiled last week in the U.S. Capitol’s National Statuary Hall is the result of a unique partnership of art and history by the firm, Daub & Firmin Studios of Kensington, California, that produced the statue. The firm’s two principals, Eugene Daub and Rob Firmin, combine the talents of sculptor and historian. Daub is an award winning sculptor with more than 30 years of experience producing public art. His partner, Rob Firmin, is also a sculptor, but his degrees in history and art history bring the firm a strong grounding in historical research. In addition, Firmin’s MBA and his experience as a business entrepreneur provide expert project guidance.